Star of stage, screen and television, Beatrice (Bea) Arthur, succumbed to cancer Saturday at her home in Los Angeles. Arthur was 86. 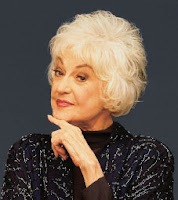 The tall, deep-voiced actress who had a razor-sharp delivery of comedy lines, found herself typecast in roles such as Maude and as Dorothy Zbornak in The Golden Girls. "Look," she once told an interviewer, "I'm 5-feet-9, I have a deep voice and I have a way with a line, what can I do about it? I can't stay home waiting for something different. I think it's a total waste of energy worrying about typecasting." Arthur began acting in Off-Broadway and Broadway shows. Her biggest Broadway triumph came in 1966 as Vera Charles, Angela Lansbury's sardonic friend in the musical Mame. Richard Watts of the New York Post called her performance "a portrait in acid of a savagely witty, cynical and serpent-tongued woman." Mame was directed by Gene Saks whom Arthur had married in 1950. The couple divorced 28 years later. Arthur is survived by her sons, Matthew and Daniel, and two granddaughters. No funeral services are planned. In 1999, Arthur told an interviewer of the three influences in her career: "Sid Caesar taught me the outrageous; (method acting guru) Lee Strasberg taught me what I call reality; and ('Threepenny Opera' star) Lotte Lenya, whom I adored, taught me economy."